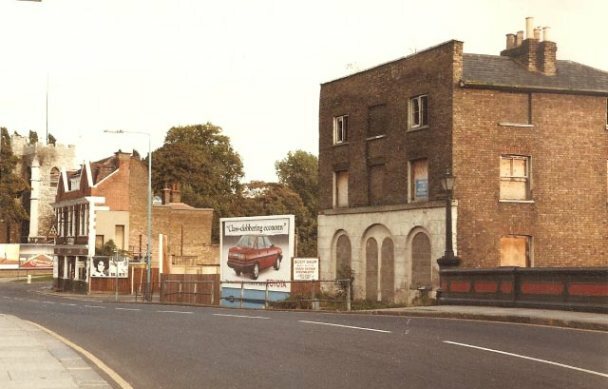 Arthur Peters has provided this photo which he took around 1975, showing Brentford Bridge and looking eastwards along the High Street. St Lawrence's church is visible after the turn to Augustus Close to the right. Numbers 157 and 168 with their distinctive arches remain, but the seven properties between the Six Bells at no. 149 and no. 157 have been demolished to make way for a new building, Canal Court. See a similar view taken by Quentin Pickard in 1972 before the demolition work started. Also see a similar view by Dave Stoneleigh, 2008, showing Canal Court.